Wire cutters. Dikes. Diagonal pliers. Known by many names and found in nearly every tool box is a pair of diagonal cutters. 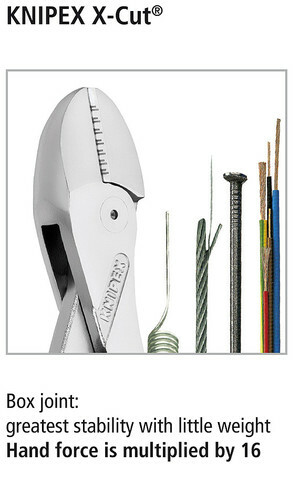 This tool is used frequently by both professionals & DIY’ers for its simple yet effective purpose: to cut wire. 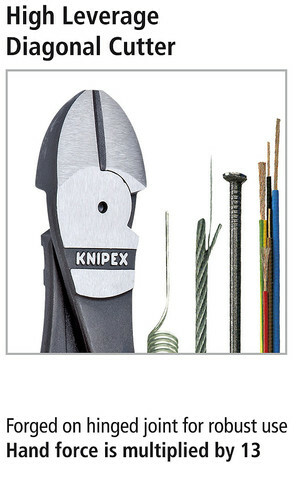 Knipex Tools are known for their craftsmanship & reliability. 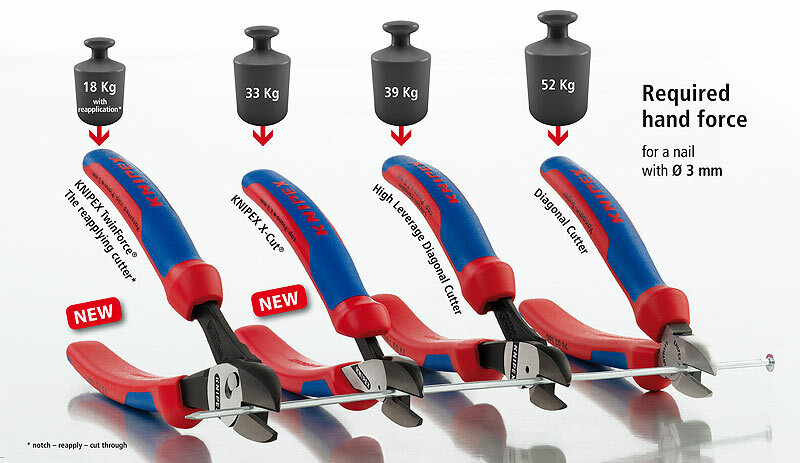 Knipex is also an innovator having 4 different styles of diagonal cutters as seen below. The 4 styles of Knipex Diagonal Cutters: TwinForce®, X-Cut®, High Leverage Diagonal Cutter, and Diagonal Cutter. The differences between the 4 series lie in the design of the joint — and subsequently the efficiency of how much hand force is transferred to the cut. Lets begin by looking at the TwinForce® series. The double-hinged design of the TwinForce series is what allows for the high transmission of force. The TwinForce can cut all types of wire, including steel tape. It can cut up to 5/32″ wire when reapplied two or three times. Standard diagonal cutters cannot match this performance. The TwinForce series is currently available in two styles: 73-71-180 (plastic coated handles) and the 73-72-180 (multi-component grips), both of which feature a beveled cutting edge. If you are going to be cutting thicker wires day-in and day-out this is the series for you, specifically the 73-72-180 with multi-component grips. The box-joint design has the highest stability at the lowest weight. 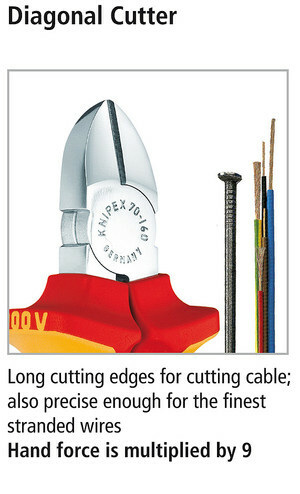 The box-joint design of Knipex’s X-Cut series allows for the highest stability at the lowest weight. 40% less effort is required compared to standard diagonal cutters of the same length. The off center pivot point allows for optimum leverage and in turn, higher cutting capacity. The X-Cut series weigh 6.2 ounces which is approximately 30% less than the TwinForce series (9.0 ounces). That may not seem like much, but if using these all day your hands will know the difference. The X-Cut series is available in 2 different models: 73-02-160 and 73-06-160 (insulated). Both models have a beveled cutting edge. The High Leverage Diagonal Cutters are by far the most popular series. With over 20 different models available in different lengths, handle materials, and finishes, this series is a good starting point if you are unsure. The location of the joint axle allows for a 20% reduction in hand force when compared to the standard Diagonal Cutters (see below). The edges are capable of cutting piano wire as their hardness is approximately 64 HRC. If you’re looking to buy your first pair of Knipex diagonal cutters, go with the 74-01-160. Small yet versatile, this pair will handle 99% of the tasks DIY’ers will throw at it. There are also a few models that have an angled head which can be advantageous — I use the 74-21-160 model to change guitar strings. The 12 degree angled head allows for a nice clean cut near the tuning pegs. All models feature a beveled cutting edge. 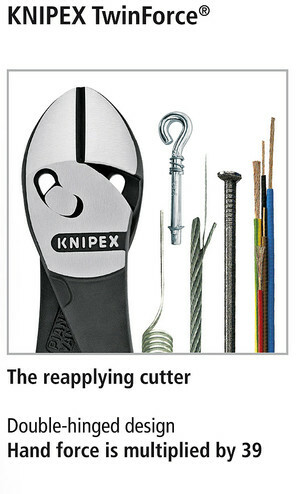 Last but not least is the standard Diagonal Cutter series by Knipex. While the other series feature joint designs that allow for more cutting power, the standard Diagonal Cutter series focuses on finesse. The edges can cut both soft and hard wire and have a hardness rating of approximately 62 HRC. This series cuts copper wires cleanly and is available in 14 models featuring different lengths, handle materials, and finishes. All models have a beveled cutting edge. We recommend these cutters for light-duty general purpose cutting. How do the box joint X-Cut pliers compare with the high leverage and/or TwinForce in terms of leverage? Will the longer handled models still cut easier than the 160mm X-Cuts? You will definitely get the most leverage and ease of cutting with the TwinForce. The X-cuts will still give you a lot of leverage. but their main selling point is that they are light and compact comparably.